Jamie Oliver baby: Jules gives birth for the 5th time. 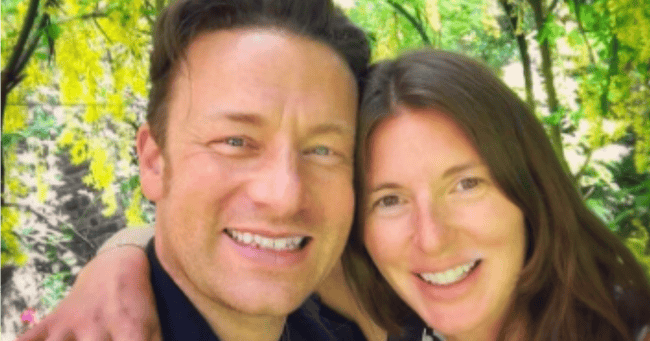 Jamie Oliver announces the birth of baby number five. Jamie Oliver has announced the birth of his fifth child. Posting on Instagram this morning, the celebrity chef said he and wife Jools are thrilled to be bringing another baby boy into the world. “And then this just happened guys!! IT’S A BABY BOY,” he wrote to his 4.7 million fans on the platform. Despite the excitement surrounding the birth, Oliver said the couple are yet to name the newest addition their sizeable family. Oliver praised his wife Jools for her composure during the birth, explaining that she gave birth naturally and in the presence of two of their pair’s eldest daughters. “Everyone in the Oliver family is very surprised and beyond happy. He arrived safely, mum was really really amazing, unbelievably composed, natural birth and my two eldest Girls got to come in at the very end as the baby was born which was amazing to witness very very emotional,” he said. According to the chef, both mum and baby are well lest a little tired after the big birth. And then this just happened guys !! IT’S A BABY BOY !! ???? Everyone in the Oliver family is very surprised and beyond happy. He arrived safely, mum / @joolsoliver was really really amazing, unbelievably composed, natural birth and my two eldest Girls got to come in at the very end as the baby was born which was amazing to witness very very emotional. 8 lbs ( that’s 16 packs of butter for you bakers out there) anyway were all hitting the hay it’s been a long day big love… bless a little baby boy Woop Woop !!!! And love to all you mums out there how amazing you are it blows my mind …. Big love jamie o p.s no baby names yet …….???????????????????????? “8 lbs (that’s 16 packs of butter for you bakers out there) anyway were all hitting the hay it’s been a long day big love.